Inspiration: Where does it come from and how can I get it? I often think of inspiration as being unattainable; something I can’t quite grasp, whether I’m working on my next blog post, teaching preschool or trying to decide what to make for dinner…again. 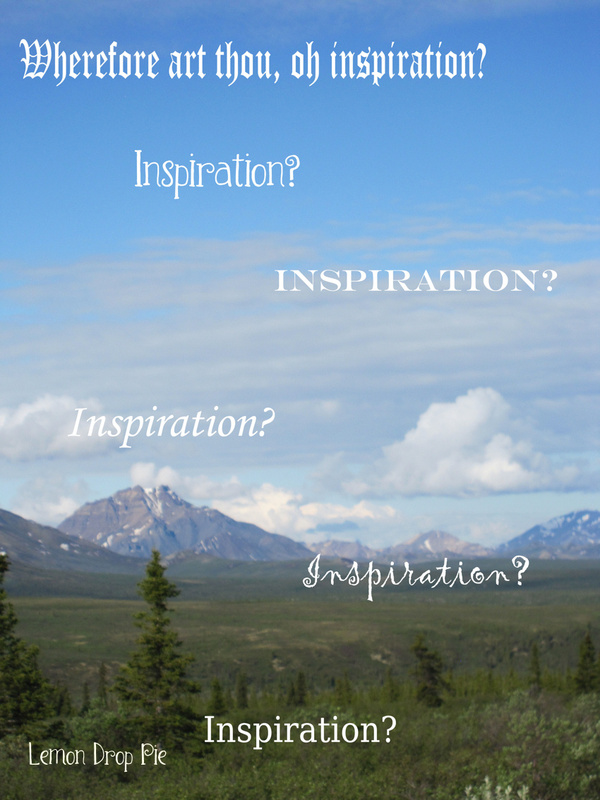 Sources of inspiration are all around me, but sometimes I’m looking so hard for that unattainable inspiration, that mountaintop inspiration, that I forget where my true inspiration comes from. Sometimes when I have writer’s block, I look to fellow bloggers. Their writing inspires me to write. A couple of years ago, I read a story about how the tall grass at the side of the road looked beautiful as the sun set behind them. As she was driving by, this blogger just had to pull over and get out her camera. She had driven by these grasses a hundred times, and had never noticed them before. The grass and the setting sun became her inspiration. Sometimes our inspiration is right in front of us. We just have to realize it! This week, it’s my turn to lead “Big Rug.” During Big Rug time, I have a routine of learning activities and then I like to do a gross motor activities with the children. Our theme this week is “police” so I sang a song with them that Emmy loved to sing in preschool: “Stop–in the name of the law!” The kids loved dancing to the music, and I felt inspired! Our children are one of the best sources of inspiration, aren’t they? Before blogging, I used to keep a journal that no one read. It was a place for me to write down my thoughts. My Monday entry would read: “This weekend Ed and I went to Countryside. We had so much fun. Then we watched a movie. It was so much fun. The next day we went for a walk. It was fun!” I would list the events of the day. Boring! Now that I blog, I’m trying to become a better writer. My posts are out here on the internet for everyone to read, which can be intimidating! Knowing that people actually read what I write, however, is also a reason I love blogging. Because of you, I want to keep on writing and make the next post better than the last. It doesn’t always happen, but I keep trying and I keep writing. You, dear readers, are my inspiration! Mountains are certainly inspirational, but there is a lot more tall grass around us. What inspires you? P.S. I wish I could find the post about the tall grasses and link to it, but I’m not sure who wrote it. Was it you? I think sometimes inspiration comes for me often when I am not looking for it. I'll be focused on something else when it comes to me out of the blue. Sometimes I try to snap a picture and keep the moment fresh in my mind so that I can write about it later. You have the best time! We love to dance too. Oh! I love your song choice! My recent post Footwear Learning Activities- Read.Explore.Learn. I get a lot of inspiration from other bloggers, definitely including you and this post! Sometimes for me the biggest inspiration is actually time away from thinking about blogging/writing. It's like my brain is on auto-pilot still looking for ideas but the rest of me is just relaxed. I don't know why that works but it always does. My recent post Six Years Gone. Like you I sometimes get inspiration from the other bloggers and I totally agree about being a better writer now that my writings are on cyber space. There are many sources that get us inspired and I can't deny that the process can be enriching. Follow me on Bloglovin here if you like it. Thanks for coming by, Claudia! I hope you comment again! Always enjoy your take on the spin of the week. Probably 25% of the things I write come from me after reading blogs, or seeing a funny thing on Pinterest, etc. Probably 75% of all posts I've ever written happen because I'm talking to Ashley. I'll be telling a story about something that happened and she'll say, "You should make that a blog post." And then I do. My recent post Who Needs A Vacation When You Can Have A “Staycation”?! I have often thought about how you and Ashley have a great system! You two are brilliant! I know exactly what you mean! I'm usually inspired at odd moments, too, and then by the time I sit down to write the inspiration is gone! My recent move to a different country certainly helped me with my inspiration levels. Just the day to day mundane stuff is a source, since it might be completely different to what I was used to. Then of course I do one meme, which is all about finding a photo to fit the prompt. Perhaps not the most inspiring, but I have to write a bit about the photo as well, I can't just put up the photo and then nothing. And there's days where the inspiration is gone. Which in itself can be an inspiration. Talking about blogging in general: it certainly helps me make me a better writer. At least I think so and one friend (who did a journalism course so she should know) told me she thought I should write articles about my new life. I'm still impressed that you write every single day! When I do that during November, it does somehow get the juices flowing. I wish I knew what inspired me. It would help me write tomorrow's post!! Somehow you always manage to write awesome posts! Oh, man. I rely heavily on writing prompts! Prompts are good things! This is based on a prompt, after all!